I left off in my last Blog with transferring the drawing to the wall by squaring the drawing and the wall proportionally. My students and I then reinforced the drawing with exterior, Mowotow, acrylic markers. These were an excellent resource that I came upon accidentally. They are real acrylic paint, so any part of the drawing that showed later on, looked as though it was a part of the painting as well. Next came the most difficult part- keying the painting. When I refer to “keying”, I mean getting the proper feeling through color and value that gives me a window into what the final piece will look like. On a small painting, one can block in the entire thing quickly and get the feel for it right away. And if not, go back and do it again. When considering something as large as a mural, this would be out of the question. So I did not want to keep going over a large area to get this sense. So early on, I worked in one particular area, multiple times until I felt the key was correct. Keying was also more difficult using acrylics. I am an oil painter and what you apply- color and value- change little as it dries. But with acrylics, one has to seriously take into account how it will look when it is dry. Acrylics dry darker, sometimes 3 values darker. The color temperature also varies with drying. I found the violets extremely difficult. They dried a lot darker and a lot redder. They were also not translucent, like oils and gave a flatter appearance. Much of my outdoor work uses a cool violet on which I add the warms of the light on top of.This took me some time to visualize and adapt. As to the paint I used: I used Fluid acrylics combined with a couple of heavy body acrylics (some colors did not come in fluid form). The fluid acrylics were great. When the bottles of 16 oz. came, I thought I would never have enough paint. But they went really far and they also glided over the concrete and filled in pits easier. I used only those colors that had been tested for exterior use and would withstand the strong outdoor light. Secondly, I added GAC 200, an acrylic medium that hardens the paint film and increases its durability for exterior use. I used the proportion of 2 parts paint to 1 part GAC 200. It appears to have bonded well and strengthened the paint film on the wall. Once applied, I could not even sand it off. The one color that I needed to order again was the white. I began with Zinc white. This had very little opacity. I changed to Titanium and this was much more opaque and spread much further over the surface of the wall. As to the process of painting the wall, it was much easier to guage the color on the warm tone I had laid down with the wall primer. After keying the color and value, I began with the far blue hills and worked my way toward the violet hills. I then worked the sky moving from the warm left side, where the sun is to the cooler right side opposite the sun. 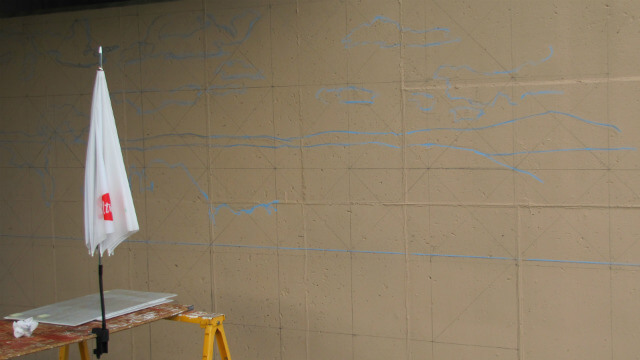 This varying of the color temperature in the sky is not done much in mural work but I felt it was successful because visually the eye is attracted to the warm area of the sky and instinctively travels the entire length moving toward the cooler areas. After the distance was under control, I moved down toward the foreground. Once I had some of the darks of the pines in the middle foreground, I had all the possible values present within the piece and I could then visualize the whole. I did not strictly work from top to bottom. I concentrated in a specific area until I covered the entire value range in that area. I was lucky I could do this. I was working on the ground and did not have scaffolding to worry about. I could also step back at anytime to view the whole. And in fact, I put in many miles stepping back. I don’t think the mural would have been as successful without this ability. The only difficult part was that when I got to the bottom of the mural, I spent hours upon hours on my knees with the palette and jars of paint on the ground. Once I felt the central motif was accurate and clear, I sensed the whole piece come together. I then worked my way toward the sides- a ridge of trees on the left and a cut-away of a cabin on the right. This cut-away section, which is around 12′ from the end on the right, will have some lettering on top of it eventually. So it needs to carry the color, but not be overly distracting to the over-lay that will be there at some point. But I also felt compelled to finish it to some degree, in case, that never happens, as it is a stage that I will not be a part of. After the whole wall was painted, I then proceeded to add some color here and there to connect the various stages of its development.This helped carry the feeling of color throughout the whole and one’s eye could easily travel across the expanse.I also added, the foreground trees that cut the visual picture plane. This created a real feeling of distance and also a feeling that one was peering through a close mass (a technique Japanese printmakers use to describe space). Last, came the necessary signing and identifying those students who helped at various stages. I chose a light gray paint of middle to light value that I had used to lay-in the drawing of the trees in the immediate foreground. This was a Mowotow acrylic marker. It really made the lettering a lot easier as it is one thing, I really hate to do. 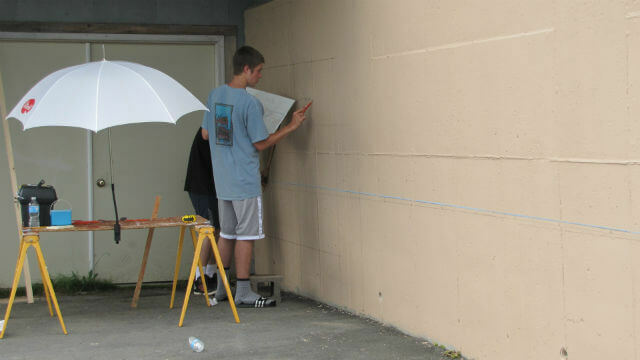 So on Friday, August 23, I finished the painting stage of the mural. One of my students transferring the image to the wall. Wonderful! it has your special color sense and what a sense of distance it has! it’s beautiful. 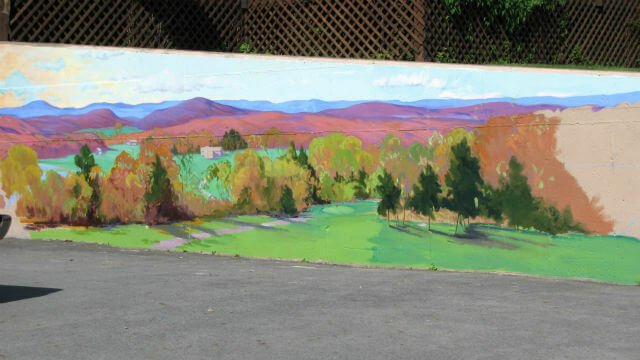 Thanks for writing about the process of designing and painting the mural I loved reading about it.